Our son, Saul, was born in 2004 in Wausau,WI. 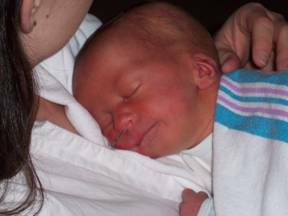 Following his birth, we were relieved to find he didn’t have Down Syndrome as we had been told there was a slight chance of it from some anomalies on his ultrasound. As we checked out our new son, we noticed that Saul had some differences. The most visible difference we saw was that his hands had 5 fingers and no thumbs. About three hours after birth, Saul was having difficulty breathing due to a small lower jaw. Not much later, the pediatrician came to tell us the laundry list of birth defects that she’d found while examining Saul. She didn’t have a name for what Saul had, and told us he needed to be transported to the NICU in Marshfield, WI. After multiple examinations, tests, ultrasounds,x-rays, and a CT scan, Saul was diagnosed as having Nager Syndrome.Saul has undergone six surgeries. These included procedures on his jaw, hands, ears, and lower abdomen. He has been receiving physical and occupational therapy since infancy, and speech therapy since age 3. He is unable to rotate his forearms because the bones are fused. His shoulders are weak and bony because his shoulder muscles are underdeveloped. He has hip dysplasia which affects his balance. His hands are weaker than normal and have functional challenges since he is lacking the muscles associated with the thumb. A surgeon was able to create thumbs for him from his first finger on each hand, but it will require much effort on his part to learn to use them well. His face is mildly affected, but did require surgery so he could breathe without assistance. As much as he has been through, Saul has had a much easier life than many kids with Nager Syndrome. Many Nager kids require multiple surgeries and procedures throughout childhood. Because of their facial differences, they often have to fight stares and unkind comments.